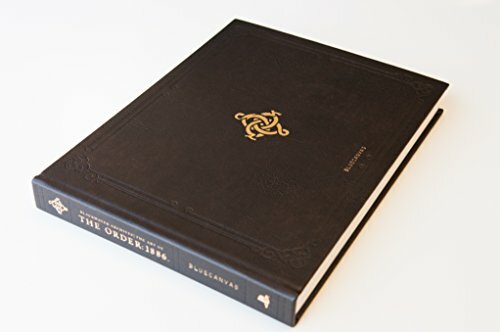 Here's the companion book to the PS4 exclusive game The Order: 1886. This is another quality artbook from publisher Bluecanvas, who also published The Art of The God of War: Ascension, The Art of Journey and The Art of Homeworld. This huge hardcover artbook has 268 pages and is leather-bound. I'm not sure if it's faux leather or real leather but it feels real to the touch. Unfortunately for me, I live in a place where it's hot and humid so extra care is needed to take care of the leather. The exterior appearance of the artbook just looks and feels premium. The paper used is the thick and non-glossy type. The concept art featured in the book covers the characters, environment, enemies and weapons. The mixture is good and since the book is so thick, there are a lot to see. For the character and creature designs, there are sketches, black and white tonal drawings, monotone 3D renders and the full colour textured 3D renders as they are seen in the game. The details are amazing. The portrait paintings are almost like photographs but has more aesthetics. The environment art are wonderful also. They capture the mood really well. They should be digitally painted but they don't have the digital look. Many I think are painted at really large sizes because when they are printed to fill a page or two, they are still look in high definition. I love the wide angle composition of the various places. There are also many in-game screenshots included and those look terrific also. It's like someone brought a film camera and went into the game to take photos. There are lots of details in the environment art and you can only imagine the amount of research that was done to get the architecture and interior design correct. This is a fantastic artbook. This should be one of the top artbooks for 2015.